We are welcoming National and International conference organizer to publish their proceedings with IJTSRD eco Journal. We provide a platform for Colleges, University, and any Educational Institute who are conducting National and International conference to share the knowledge. The group of papers will be accepted and will publish under our eco Journal special conference issue. IJTSRD being a part of eco friendly community promotes the e-publication mode by publishing all its journals through subscription of IJTSRD ECO Journal. Conference special promotion through digital marketing like Facebook and Twitter of all your selected manuscripts along with organizer details. Provide Certificate to all participants along with organizer details and many more..! 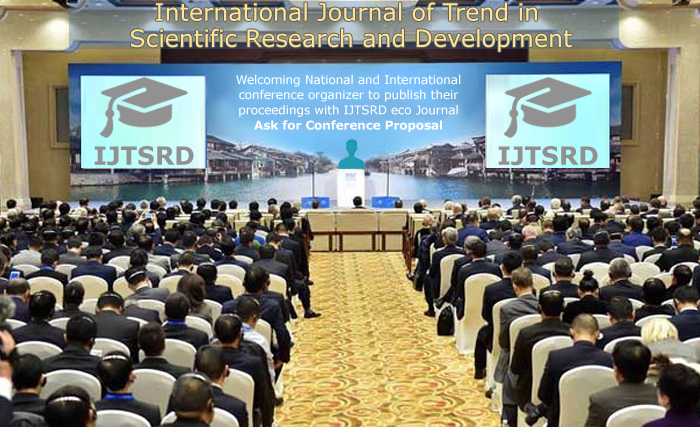 We are welcoming conference proposal from all conference organizers who are interested to publish their selected manuscripts with International Journal of Trend in Scientific Research and Development - IJTSRD are requested to contact on given below details.